How’s the weather where you are? If you’re lucky enough to live anywhere in Canada then you’re probably experiencing a pretty dramatic cold spell right about now.. I feel you, it’s disgusting. Okay let me be honest about something, I’m a summer baby through and through, I hate the winter, I hate being cold and I hate the grey rainy weather that comes with living in BC. That being said there are a few things that I do every year to make the winter a little bit more bearable - the first of which is up my coziness game to a solid 1000. I wear fuzzy socks, wrap myself in blankets, drink 900 cups of tea a day and ALWAYS have a nutrient dense warming soup prepped to have on hand in my fridge! Lately I have been absolutely loving this curried butternut squash soup and it has become a staple in my meal prep rotation for the last few weeks! It’s vegan and dairy free, warming from the spices, creamy and smooth and has the most subtle sweetness from the green apple. It’s honestly next level and super simple to make. Whip it up this week, you definitely won’t regret it! Roast butternut squash on a baking sheet, flesh side down at 425F for 45 minutes or until soft. Scoop cooked butternut squash out of skin and set aside. In a medium pot, heat avocado oil. Add onions and garlic to pot and cook until fragrant and translucent. Add in diced apple and cook until soft. Add in all spices and stir until onions, garlic and apples are evenly coated in them, cook for 1-2 minutes. Add in butternut squash and vegetable stock, stir and bring to a boil. Reduce heat, cover and cook for 25 minutes. 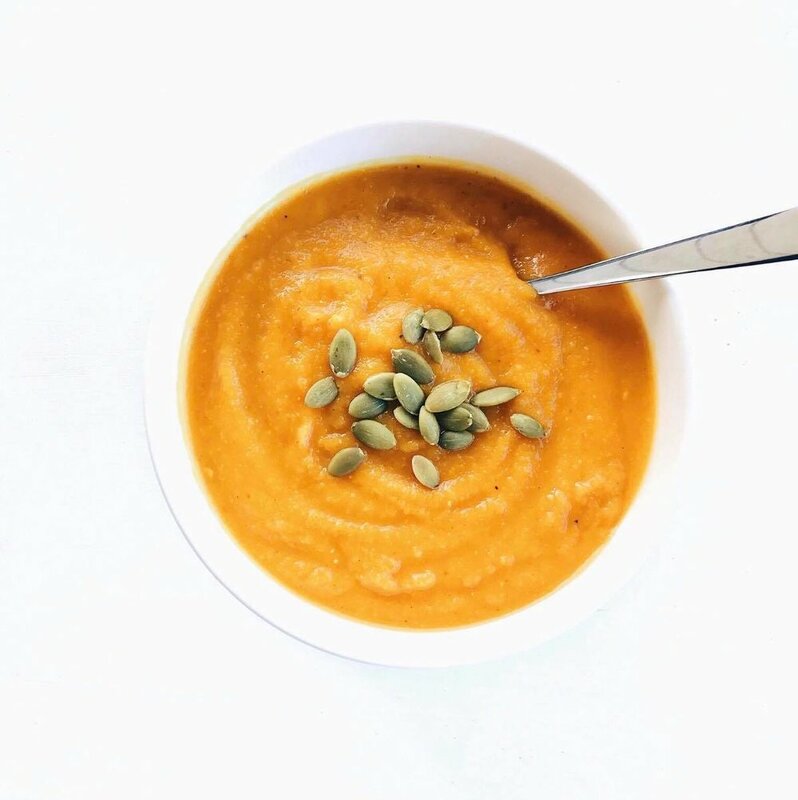 Transfer soup to a high powered blender OR use a hand blender, puree soup until creamy, add in coconut milk and blend for 1 more minute. Pour soup back in pot and cook on low for 10 more minutes.